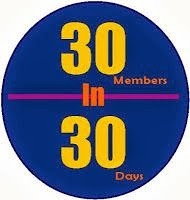 In our continuing effort to force entice you to join Northern Colorado Writers during our 30 Members in 30 Days campaign, founder Kerrie Flanagan has come up with something new. We're not talking about 'new' as in New Coke. More like 'new' as in Orange is the New Black or The New Zoo Revue. In other words, it's big doings. For years NCW has offered a one size fits all membership that includes community gatherings, pertinent writing information, and discounts for classes and the annual conference. This fall, Kerrie introduced a second level of membership for those looking for more promotion and presence. Ladies and gentleman, I give you the Professional Membership. Wait. That last one isn't right. Johnny: Well, Rich, I've shaved my knuckle hairs for this occasion. How did you get out of the broom closet? Johnny: I'm a game show announcer and a professional thief. You're not giving full body massages. Johnny: Only to the female members. Johnny: I cut all the fungus off of my fingernails. Johnny: Don't make Johnny angry. You wouldn't like Johnny when he's angry. Folks, head over to the NCW website and sign up for a Professional Membership before October 27 so we can avoid Johnny going all green and breaking stuff. This is a great idea -- the perks available for a professional level member are excellent.